You can access the Options menu directly from the OCR module’s ribbon. 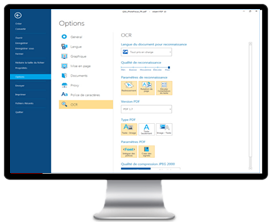 The OCR settings include Document Language for Recognition, Recognition Quality, Recognition Settings, PDF Version, PDF Type, PDF Settings, and JPEG 2000 Compression Quality. In Expert-PDF, open a PDF file containing a scanned document or image. Click on “OCR” tab in the program’s toolbar. Expert-PDF automatically runs optical character recognition and creates a fully editable copy of your PDF. You can run OCR on multiple files at the same time. Expert-PDF automatically applies the original fonts of your scanned image. Name the generated PDF file and save it at a location of your choice.